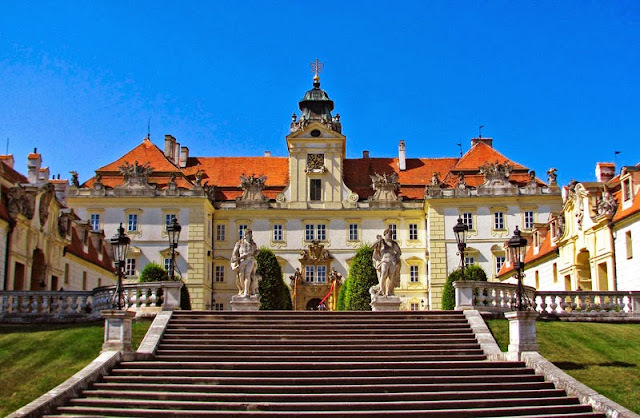 Valtice Chateau,originally a medieval castle, was founded perhaps in the 12th century by the bishops of Passau or by the Austrian Seefelds (Valtice belonged to the Lower Austria until1920). From 1387 until 1945 it remained in the hands of the Liechtenstein family. The castle was rebuilt several times, alterations in the Renaissance stylewere made in the 2nd half of the 16th century. Damaged by the Swedes in the years 1645 - 1646, it had to undergo the long-term Baroque reconstruction. The original Renaissance part of the former castle was converted into a two-storey entrance façade, in places of other buildings three wings of the chateau complex were constructed and a garden was established. At the same time the area between the castle and the town was turned into the court of honor (farm buildings, a theater, a riding hall, etc.). Prestigious architects were involved with the construction of the chateau - F. Carratti, G.G. Tencalla, A. and J.K. Ernas, D. Martinelli, A. Beduzzi, A.Ospel as well as a sculptor F. Biener and a plasterer Alberti. During the 18th century castle gardens and a park were remodelled, in the early 19th century extensive alterations of surrounding landscape were made for John I Lichtenstein. In 1945 the Czechoslovak state took over the care and maintenance of the property.